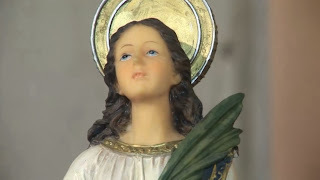 (Saint Lucy of Syracuse): “My beloved brethren, I, Lucia, Lucy of Syracuse, rejoice for coming today to give ye another Message and bless ye. Pray the Rosary, in all the trials, in all the sufferings of your life. Pray this so powerful prayer that the Mother of God gave ye and that is the Source of all graces for ye. When your life does not seem to make sense anymore, when it seems to have no exit, or solution, pray the Rosary. Pray, pray, pray. The Lord will hear your voice, the Mother of God will hear your voice, your prayers will not fall on deaf ears and She sooner or later will come give ye the answer to all your prayers and also the prize of your perseverance in prayer. Pray the Holy Rosary because only with it, only with the Chaplets that the Mother of God gave ye and ordered that ye pray Here, ye will be able to have the victories of God's grace in your life. I, Lucy of Syracuse, am with you, your prayers are all seen and heard by Me and I will help ye in every moment of your life. I am with you, I love ye and as I have promised ye so many times Here, I will never ever leave ye alone, I will always be by your side and all the graces that are the Lord’s Will, I will obtain for ye if you ask Me with trust and perseverance. Pray, love, fulfill your obligations every single day, be zealous in prayer, in work, in study, in cleaning your house, in the fulfillment of all your Christian duties, thus you will be pleasing to God. To everyone now, I bless with love. I pour upon ye all the blessings from the Hearts of Jesus, Mary and Joseph.